Australia isn’t dubbed the lucky country for no reason. I mean, just stop and take a look around you. We’re truly blessed. When I was a kid I thought the fact my parents never took me overseas was a travesty of justice. Dad staunchly maintained that we needed to see Australia and appreciate what we’ve got before we travel abroad. I didn’t get it then, but I get it now. Let’s think about the land for a minute. We have this hot, flat, bone dry continent that is predominantly uninhabitable. From the ocean to the centre it graduates from blue to green to yellow to red and various tones of every colour in between. And it’s home to a plethora of unique flora and fauna, including some of the most dangerous species on the planet. On the topic of animals, did you know that the emu and the kangaroo are on the Australian coat of arms because they can’t walk backwards? Some might say that Australian’s are an odd breed. I guess it’s hard to digest how people can be so unpretentious, so profane and so self-deprecating. The true Aussie character shows in our laid-back attitude, sense of humour and tenacity. If you need proof, just look to Aussie euphemisms like: “she’ll be right mate”, “larrikin” and “the great Aussie battler”. I imagine that those responsible for our greatest inventions – hills hoist, ugg boots, goon bag, rubber dingy and vegemite – were just “giving it a good ol’ Aussie go”. It’s fair to say we take our unique social character for granted. Travel to almost anywhere in the World and they love Australians, yet we have one of the most pronounced cultural cringes of any society. It’s interesting because as much as we reject our own style, we are inclusive of others regardless of gender, race, social status or financial background. An egalitarian, down to earth culture that takes everyone at face value, yet we are prejudice against our own most endearing qualities – go figure. On the 26th January we’ll be celebrating Australia Day, as we do every year, with a BBQ and backyard cricket. It’ll be 228 years since the arrival of the first fleet of convicts in 1788, which marks the birth of our civilisation, but no one will really think about that. It’s an Aussie tradition that we love, and that’s all that matters. 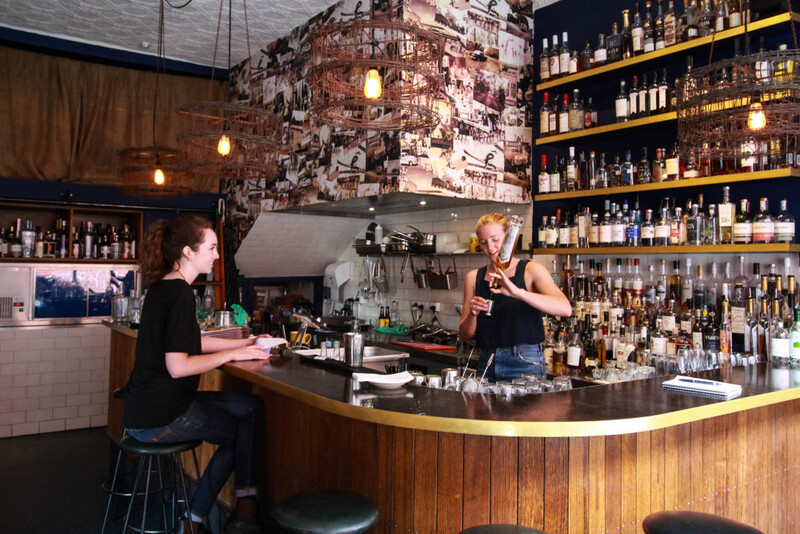 This year, my Australia Day tip of the hat goes to Victoria’s Bar of the Year, Bad Frankie. Who the heck is Bad Frankie? Good question. I promise we’ll get to that. When you step into Bad Frankie you might feel like you took a leap back in time. Think 1970’s. It’s summer holidays and you’ve just stepped out of your caravan wearing nothing but your thongs, shorts and singlet. You’re making a b-line to the local diner for a toasted sanga. 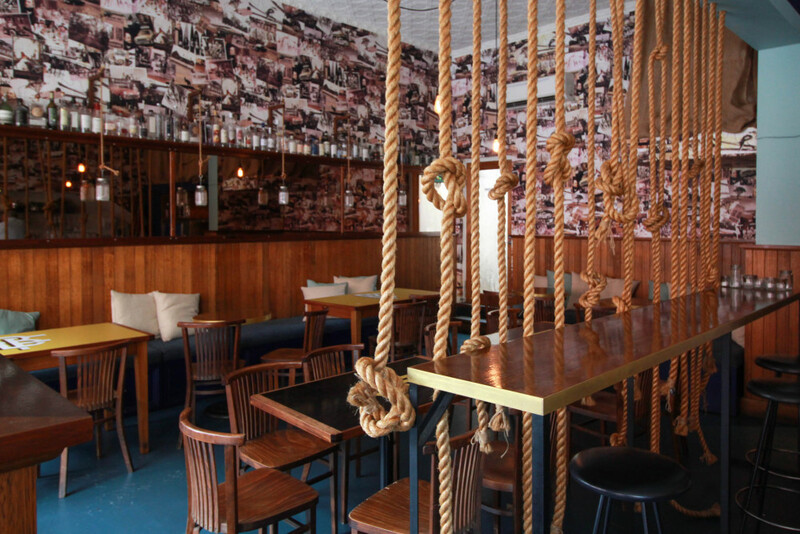 The bar has enough Australian touches to create the perfect level of nostalgia. The wallpaper may be the ultimate detail, featuring everything from vintage Holdens to native birds, Tassie devils and domestic scenes from the stereotypical Australian household. Personal touches like the wall of photo frames make the place feel homie, but it’s essential to take a close look at those photos to see it’s a family album of a different kind. Like anyone that travels to the United States, Bad Frankie’s owner Seb Costello was particularly taken with the quintessential all-American diners. The combo of flashy neon signs, vinyl booths, jukeboxes, big juicy burgers and pinup like waitresses in Nashville, left an incredible impression. It was an authentic cultural experience that Seb wished he could bottle and bring back. Then Seb encountered the same type of experience south of the border. Over tacos and tequila, he found himself bonding with locals and immersing in the Mexican way of life. Asking locals to name their favourite tequila, the answer was always the same: such and such (sic) “where my brother or cousin or grandfather is the distiller”. He was struck by the family connections everyone had to their favourite spirit. This was a defining moment for Seb. His dream had been to burger or taco joint in Melbourne. However, recognising that he wasn’t American or Mexican, he realised his venture needed to be authentically Australian. Not ocka, crude and cliché, the way Australia is so often portrayed, but genuine, iconic and honest. 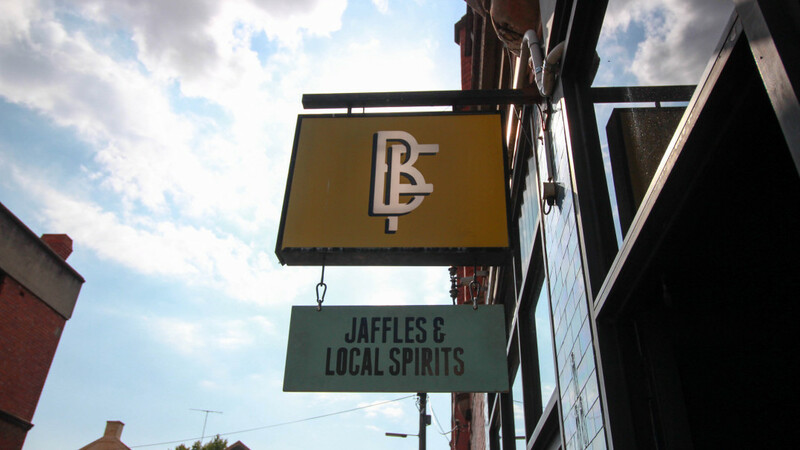 The spirits at Bad Frankie aren’t neatly tucked out of sight. They are proudly displayed behind the bar and are as much a part of the décor as the chairs and tables. 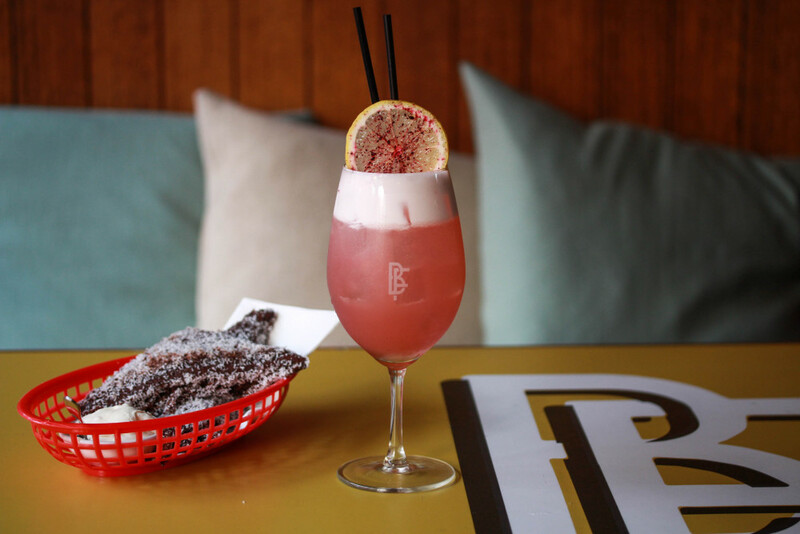 With over 260 Australian products including a full range of spirits, liqueurs, syrups and mixers, Bad Frankie takes the concept of buying local to another level. Seb isn’t satisfied with just tasting the product, he wants to meet the makers, touch the raw materials and witness the production process. This is where the wall of photos comes in. Distillers have become an integral part of the Bad Frankie family. 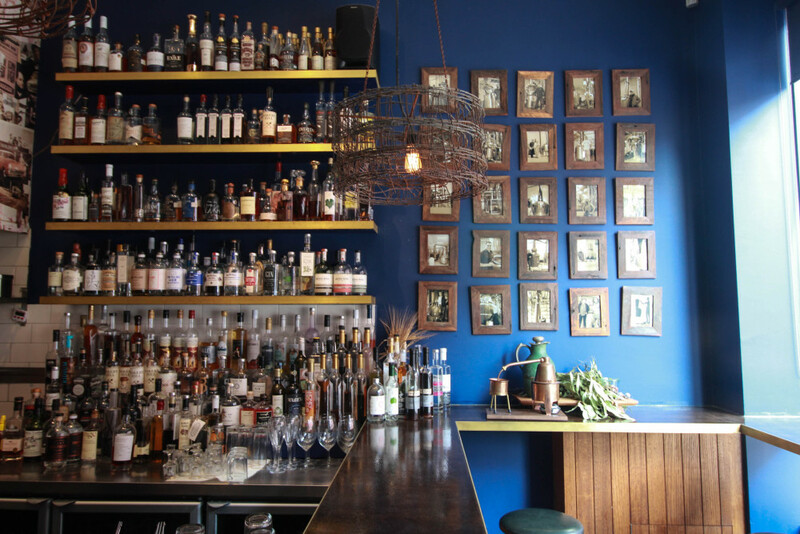 Visiting distilleries help tie people emotionally to the spirit, and having visited about 80% of the distilleries, Seb is about as passionate about Australian craft spirits as it gets. It’s a new industry built by a bunch of tough characters that had the courage to give it a crack and conquered. What’s on the Menu? Jaffles. Gooey, delicious jaffles. As kids they were the after-school snack of choice. Who would’ve believed last night’s left overs shoved between two slices of bread could taste so good? Oh, and the classic cheese and vegemite. Jaffles at Bad Frankie include all the classic savoury flavours plus some combos that resemble the type your Nana would make. 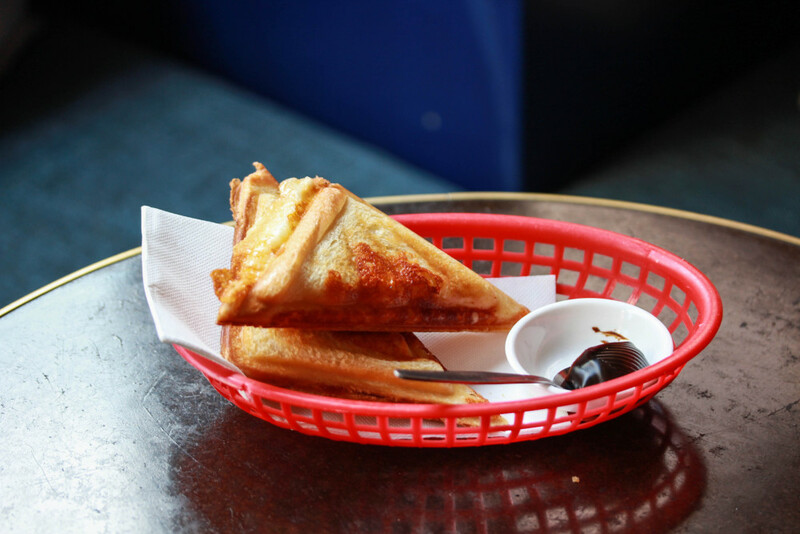 It’s also the place where the lamington jaffle was invented so save room for dessert! So, Who is Bad Frankie? The fat, dismembered head woven into the montage of photos that makes the wallpaper at Bad Frankie… The one that’s seemingly floating above the other symbols of Australiana… Well, that is Bad Frankie. In a nutshell the guy was the antagonist to distilling. He also had his head on the Five Pound Note. Sir Governor John Franklin banned distilling in Australia in 1838. It’s thought that this was either because his wife was a staunch supporter of the temperance movement, or because his mate was the brewer of Cascade beer. The ban wasn’t lifted til 1992. 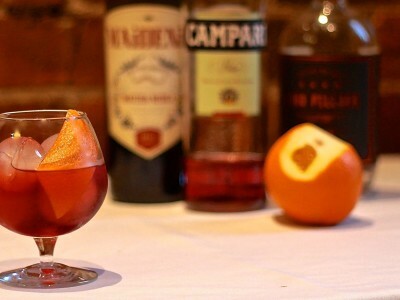 For those that love a good story over a drink, Bad Frankie can deliver. 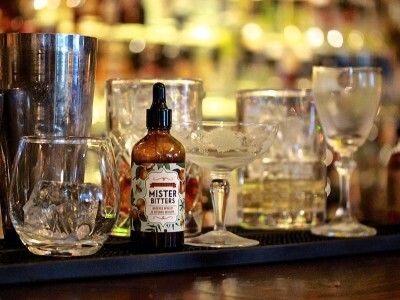 Relaying the stories behind to the distilleries, Seb and his team weave connections that echo his experience in Mexico. 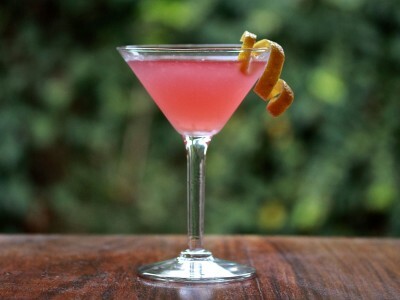 The cocktail list is, of course, Australian themed signatures, and all ingredients and garnishes are 100% Australian. 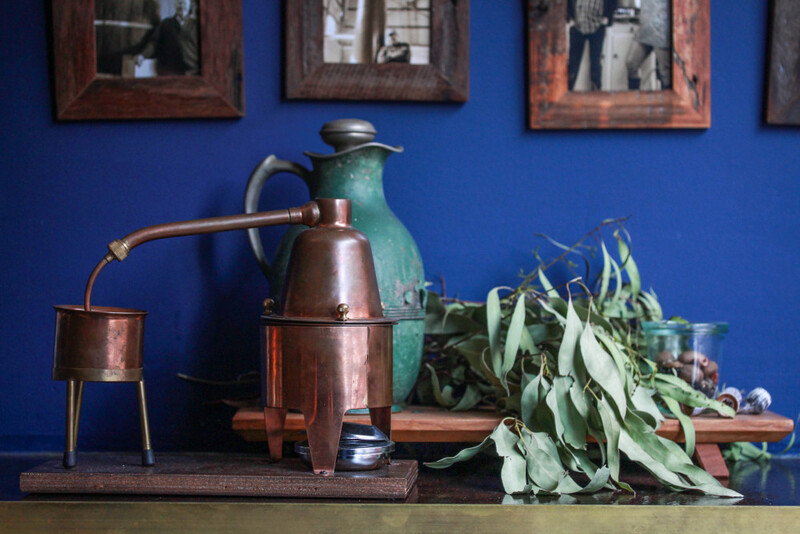 Oddments, such as glassware, are sourced through op-shops and add an extra layer of nostalgia to the mix. It’s a deliciously fun, engaging experience. 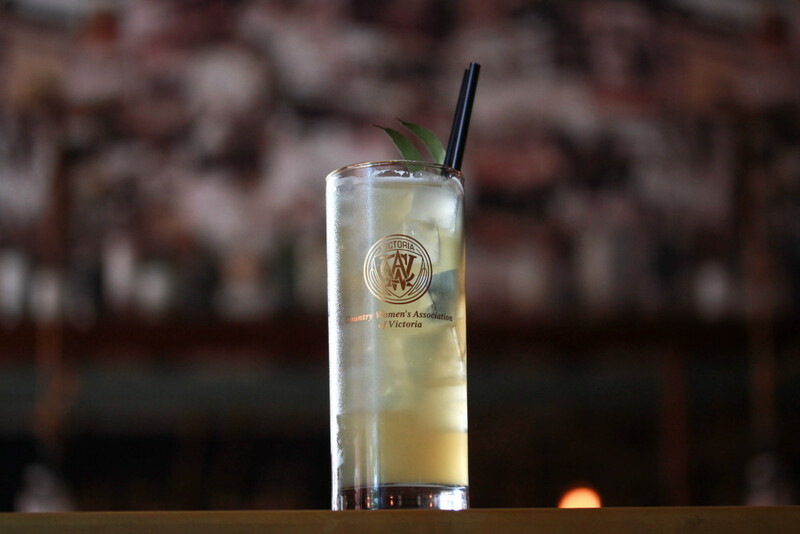 Saint Agnes VSOP Brandy, cinnamon myrtle, vanilla, eucalyptus and apple juice. 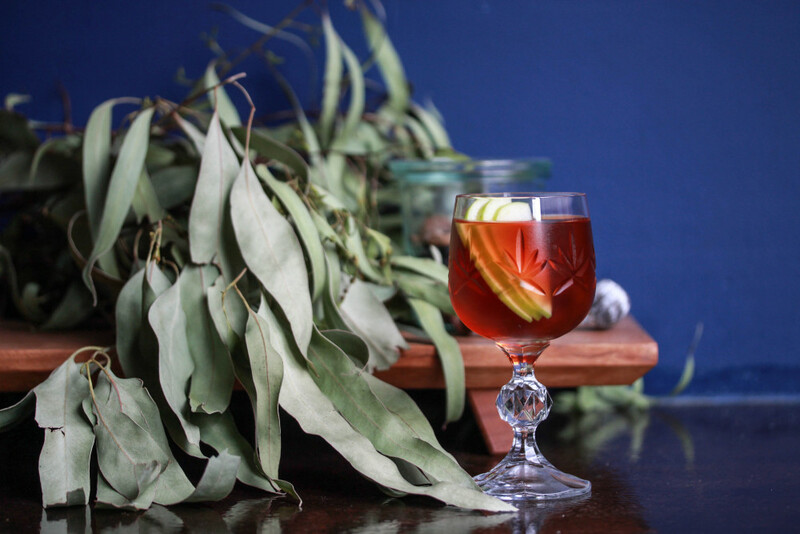 Garnished with eucalyptus leaves. Fresh and summery. The glass from the Country Women’s Association of Victoria made me giggle. 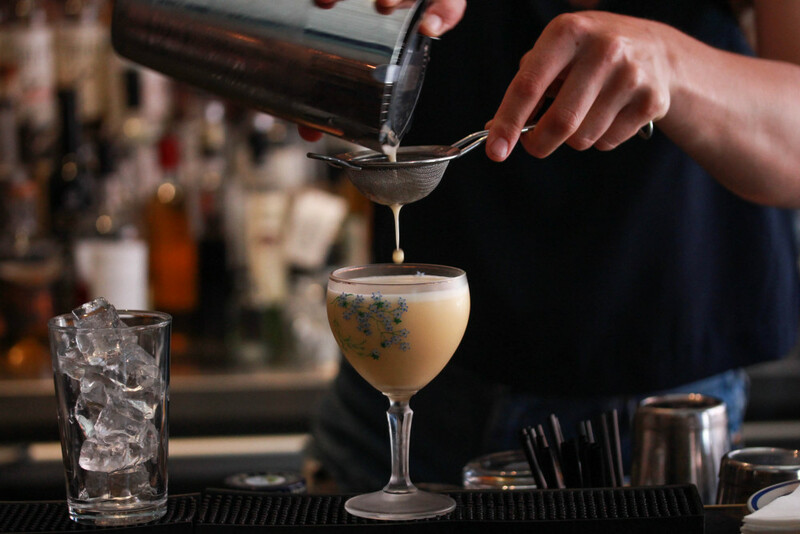 Melbourne Gin Company Gin, lemon and pepperberry syrup, egg white and soda. Garnished with a lemon wheel and grated pepperberries. Light and refreshing. Deliciously served with a side of lamington jaffle.